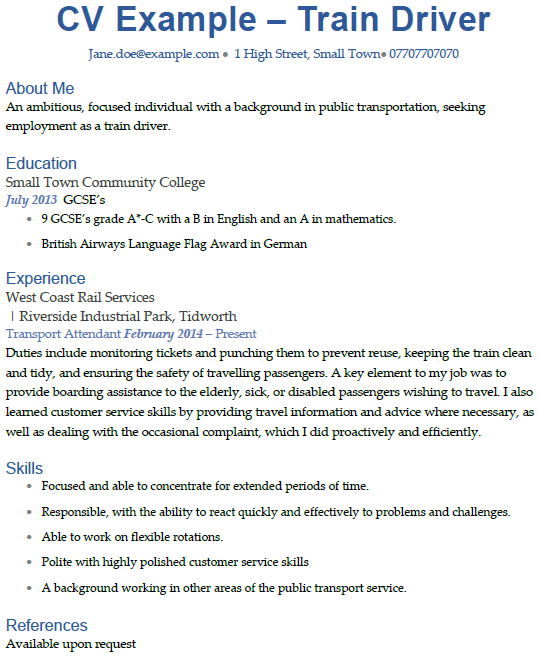 Use this cv example for Train Driver job applications. An ambitious, focused individual with a background in public transportation, seeking employment as a train driver. 9 GCSE’s grade A*-C with a B in English and an A in mathematics. Duties include monitoring tickets and punching them to prevent reuse, keeping the train clean and tidy, and ensuring the safety of travelling passengers. A key element to my job was to provide boarding assistance to the elderly, sick, or disabled passengers wishing to travel. I also learned customer service skills by providing travel information and advice where necessary, as well as dealing with the occasional complaint, which I did proactively and efficiently. Focused and able to concentrate for extended periods of time. Responsible, with the ability to react quickly and effectively to problems and challenges. Able to work on flexible rotations. 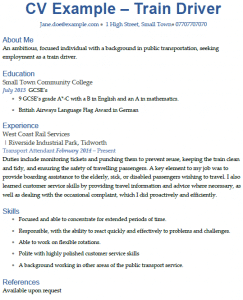 A background working in other areas of the public transport service.